New PhD students in the Driskill Graduate Program in the Life Sciences included students from as far away as Puerto Rico, Russia and India. 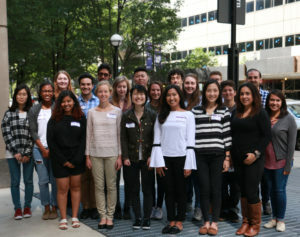 New PhD students from around the world have arrived on campus, joining the Driskill Graduate Program in the Life Sciences (DGP), Northwestern University Interdepartmental Neuroscience Program (NUIN), Medical Scientist Training Program (MSTP), Clinical Psychology PhD program, Doctor of Physical Therapy/PhD Engineering [DPT/PhD (Eng)] dual degree program and the Health Sciences Integrated PhD (HSIP) Program. This year, DGP welcomes thirty new PhD students from as far away as Puerto Rico, Russia, India and as close as the Midwest. DGP students complete courses and lab rotations during their first year, which allow them to explore various types of research before selecting a dissertation lab and project. NUIN has 20 incoming students who will rotate in at least three different laboratories and complete coursework before committing to a single lab to conduct thesis research. New Students in the Northwestern University Interdepartmental Neuroscience Program rotate in at least three different laboratories and complete coursework before committing to a single lab to conduct thesis research. MSTP welcomes 15 new students who will earn both their MD and PhD degree at Northwestern. They will complete two years of medical school before starting their doctoral program in a lab. Once they earn their PhD, they will return to medical school to complete their Doctor of Medicine degree. This year’s entering class includes students coming from competitive universities such as Dartmouth, Harvard and Yale. Four new students are joining the Clinical Psychology PhD Program, coming from the east and west coasts and as close as Evanston. They will spend six years at Feinberg for training in the clinical practice and science of psychology, along with specific training needed for careers as clinical psychologists conducting research and/or clinical work in academic medical centers or other healthcare settings. The DPT-PhD (Eng) program welcomed one new student, Marsalis Smith, who will earn both his DPT degree and PhD in biomedical engineering at Northwestern. He will complete two years of engineering school before starting the DPT program at Feinberg. Once he earns his DPT, he will return to engineering to complete his PhD degree. Smith is from Washington D.C. and holds two bachelor’s degrees. Three new HSIP students make up the program’s sixth entering class. 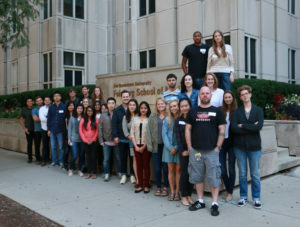 Unique to Northwestern, HSIP trains students in processes and methodologies in clinical and population sciences through the Institute for Public Health and Medicine. This year’s students come from the Philippines, New York and Chicago.